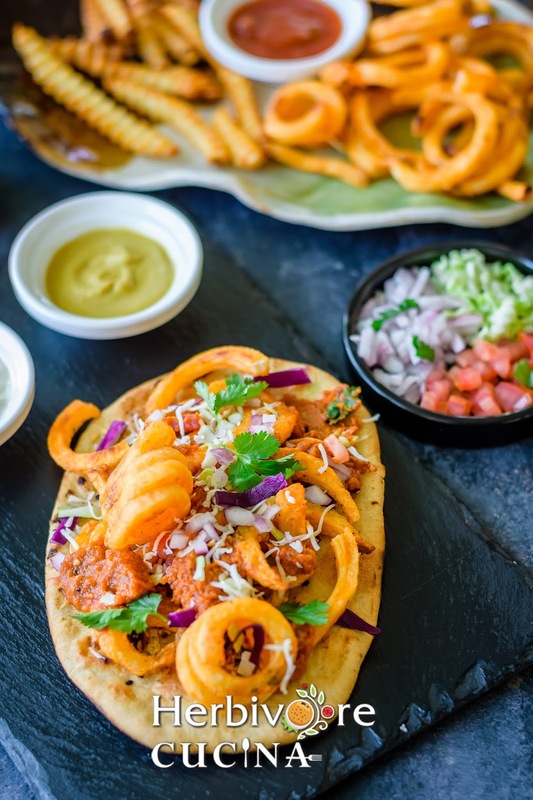 Seasoned Fries loaded with Indian curry sauce, salad and cheese; this game-day recipe doubles as Naan wraps. Addictive and easy to make! April is racing fast and we are all gearing up for a LOT of parties. Lots of game-days, spring parties and summer grilling events are in sight. This year I am planning some fusion recipes for all these parties! 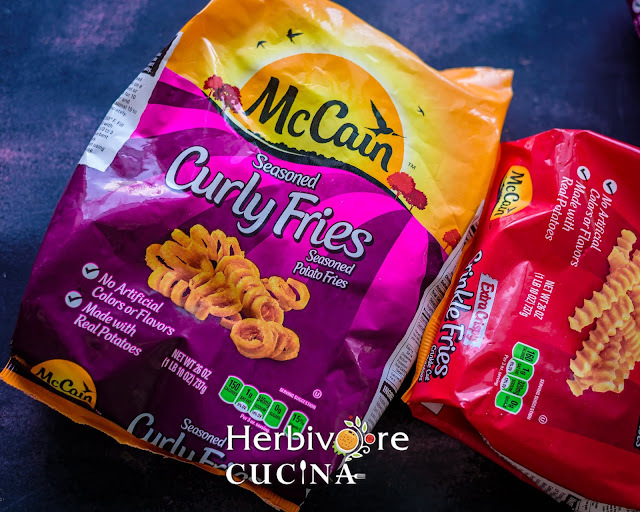 One of my favorite ingredient to enjoy at parties in my house or to take along for get togethers is everything from the collection by Mc Cain®. Their Extra Crisp Crinkle fries and Seasoned Curly Fries have a permanent spot in our game-day menu. Not to forget the Mashed Potato Smiles, a favorite for kids and adults alike! Made from real potatoes, this company is the world's largest manufacturer of frozen potato products! Here are my favorites from their product line: McCain® Craft Beer Battered Thin Cut Fries are PERFECT to load up with toppings,McCain® Smiles® Mashed Potato Shapes, fun shapes loved by kids and adults alike and McCain® Seasoned Curly Fries Seasoned Potato Fries adds a burst of flavor to your menu. 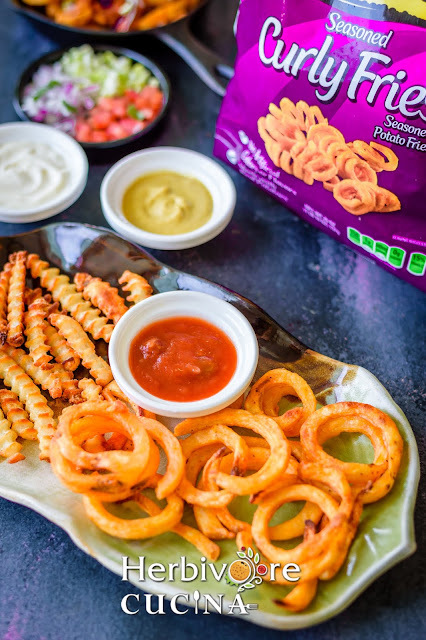 These products have a crispy exterior for a satisfying crunch with every bite and they are great for dipping and layering too. If you love their products too, do not forget to buy it ALL before 5/31/19. Wondering why? 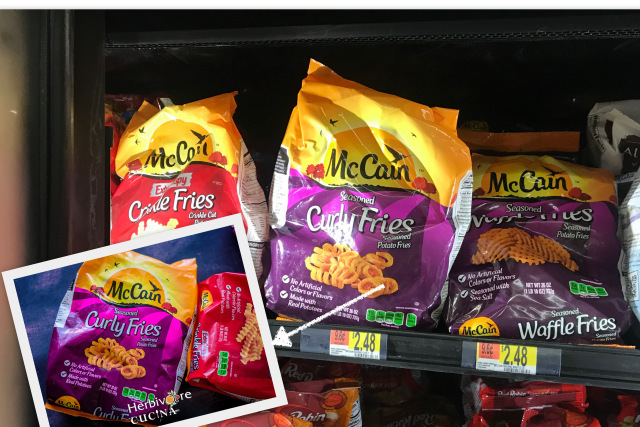 Now until 5/31/19 you can get $1.50 rebate when you buy 2 or more participating Mc Cain® products from Walmart. Submit your details here to get the rebate! 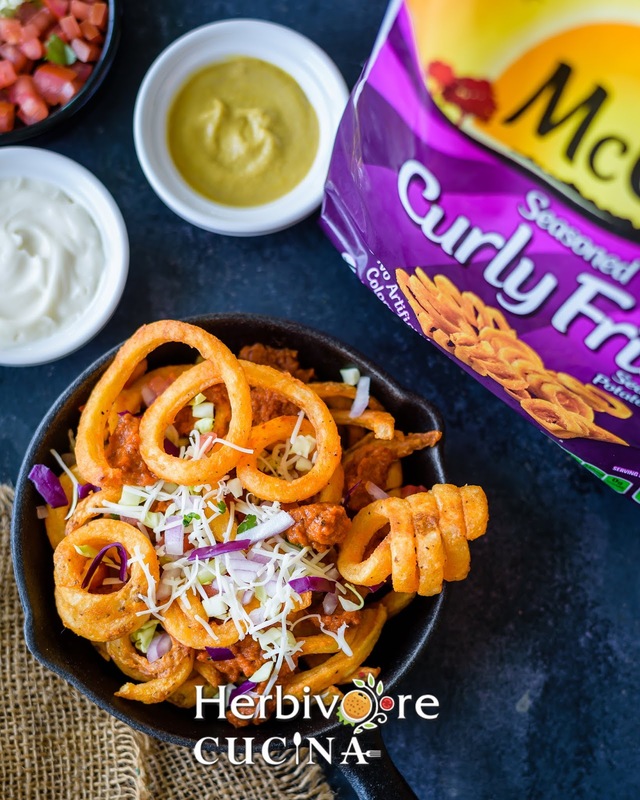 This time I made the game-day spread using Nachos made from Seasoned Curly Fries, Naan breads to wrap the Nachos and make wraps, Crinkle fries and a few dips like curry sauce, mustard, salsa and mayonnaise. The spread was PERFECT and is now going to be repeated at another gaming event! Why make Nachos with Fries? For the longest time my game-day recipes would be traditional chips and dips, nachos made using them and served with tortilla. This time around I decided to innovate the traditional combination and turn everything on its head. I replaced corn chips with seasoned fries, taco sauce with freshly made curry sauce and tortilla with store bought naans! The combination was perfect and now this form of nachos is made VERY often in our house, for parties or for weekends. Everyone enjoys it as it has the perfect balance of spice, crunch, cheese toppings and is super easy to make! 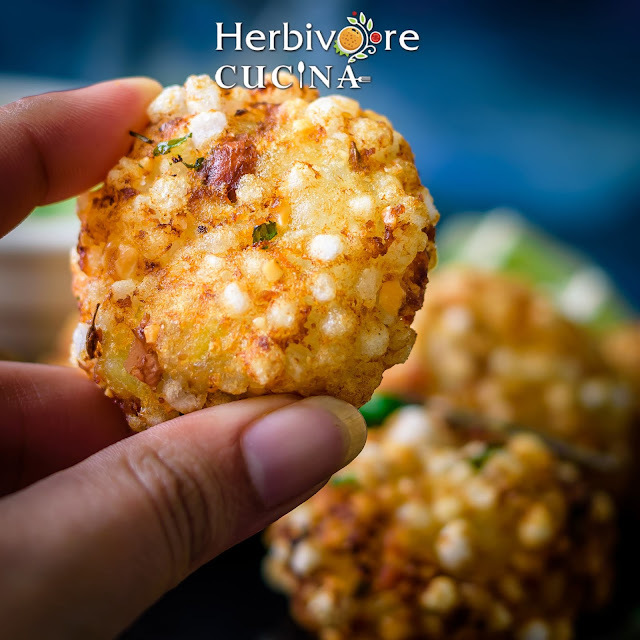 One more reason to make this addictive snack is that it requires ingredients that are ALL available at Walmart. I made one trip and I got everything I needed for the recipe! Plus, after the ingredients were bought, I could make the recipe in under 30 minutes! Make the toppings and sauce before hand. Just before the party, make the nachos and serve. Once the preparation is done, it only takes 15 minutes to put it together! Plus, the recipe doubles or triples wonderfully. Make it for a family or please a crowd! How to make Fries Nachos PERFECT each time? This recipe has a few ingredients and MOST of them can be customized based on how you like. 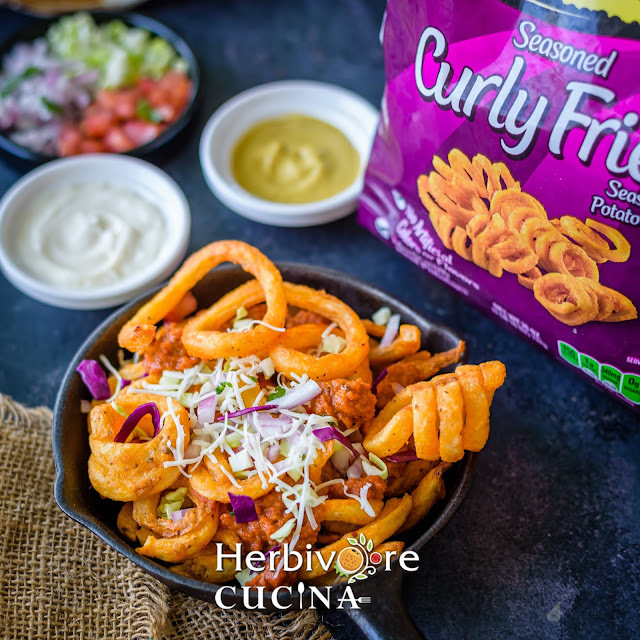 I used the Seasoned Curly Fries for this recipe but the Crinkle fries work equally well for the recipe. I baked the fries in the recipe but fried ones work amazingly well too. I made the curry sauce from scratch as it does not take a long time. However, the same can be bought from the store and used off the bottle. The only other toppings I used are vegetables and cheese. Adding corn, peppers, sautéed vegetables and paneer works really well too. I love the recipe with the add-ins too. How to serve the Nachos? For my latest game-day party I made the nachos in a cast iron skillet. Along with that I also baked some extra Seasoned Fries and Crinkle Fries. I served the Nachos with a side of Naan for my friends to make their own Naaniza or Wraps. Along with the delicious fries, there was salsa, curry sauce, mayonnaise and mustard for people to dip their fries. I LOVE the fries without any dip, especially the seasoned ones! So now, look no further and make this for your next game-day! I would LOVE to hear how it turned out for you all! Blend the onion, garlic and ginger to a smooth paste. Heat oil in a pan. Once hot, add the paste. Sauté till the onion is cooked, about 4-5 minutes. Next add the canned tomatoes, red chili powder, sugar and salt. Let the sauce simmer till the tomatoes are mushy. Add the Garam masala and cumin powder. Mix well. Remove from flame and set aside. 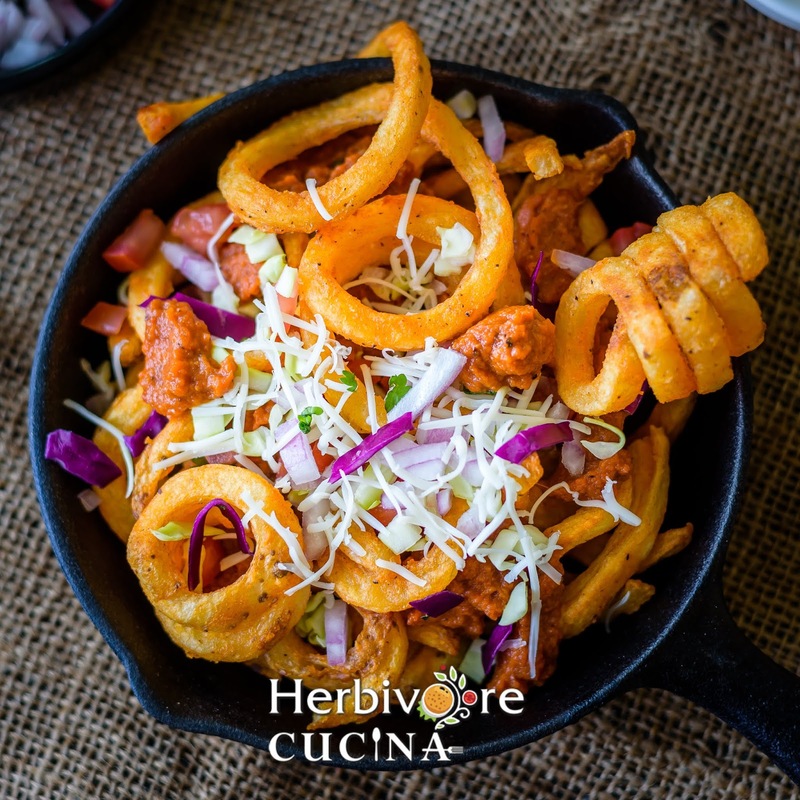 Preheat oven to 450 F. In a baking tray arrange the seasoned curly fries in a single layer. Bake for 10 minutes. Then turn the fries over and bake for another 10 minutes. Remove from oven, add the curry sauce and half the shredded cheese. Bake for another 5 minutes, till the cheese melts. Meanwhile, mix together onion, tomatoes, cabbage and lettuce. Sprinkle cumin powder and lime juice and mix well. Once the cheese melts on the nachos, remove from oven. Spread the salad on the fries and serve. 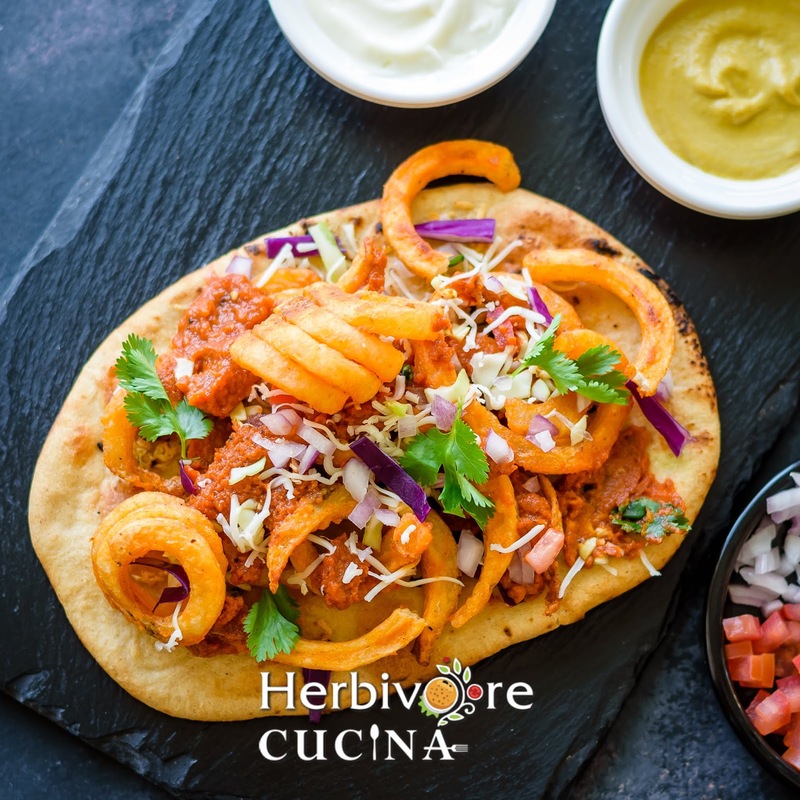 To enjoy the Nachos in wraps, place some of the prepared fries on naan and enjoy as a wrap. 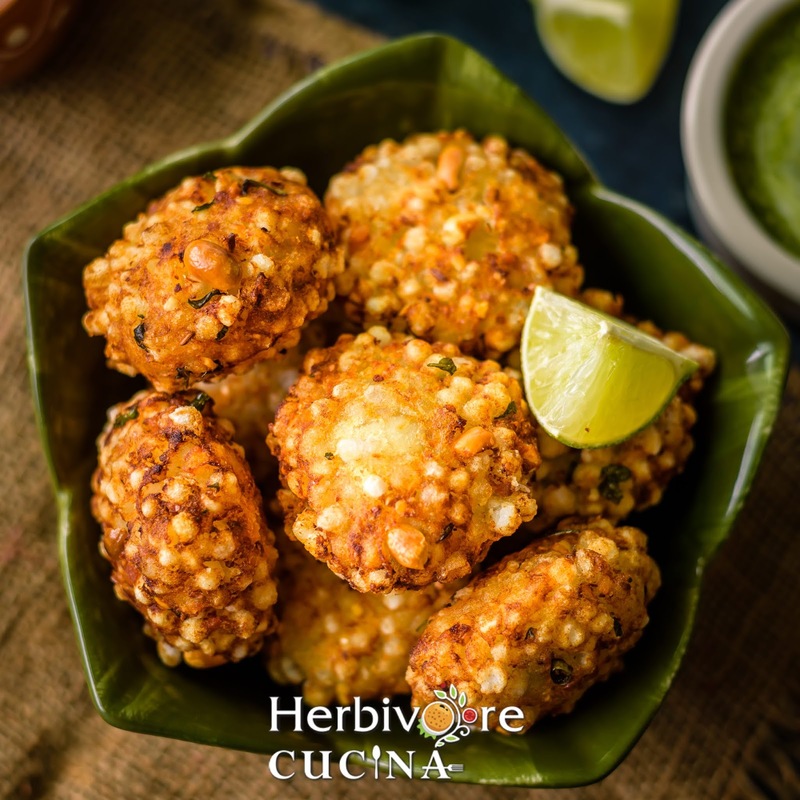 Sabudana Vada, fritters made from tapioca pearls and a few other ingredients are addictive yet easy to make! Sabudana Vada, a popular Indian snack is one of our favorite recipes. Fritters made from tapioca/sabudana with a few other ingredients, these are crisp outside and perfectly soft inside. Served with cilantro chutney, these are great for fasting days like Navratri, Maha Shivratri and so on. For the longest time I have been making the non-fried sabudana vada, made in the paniyaram stand. 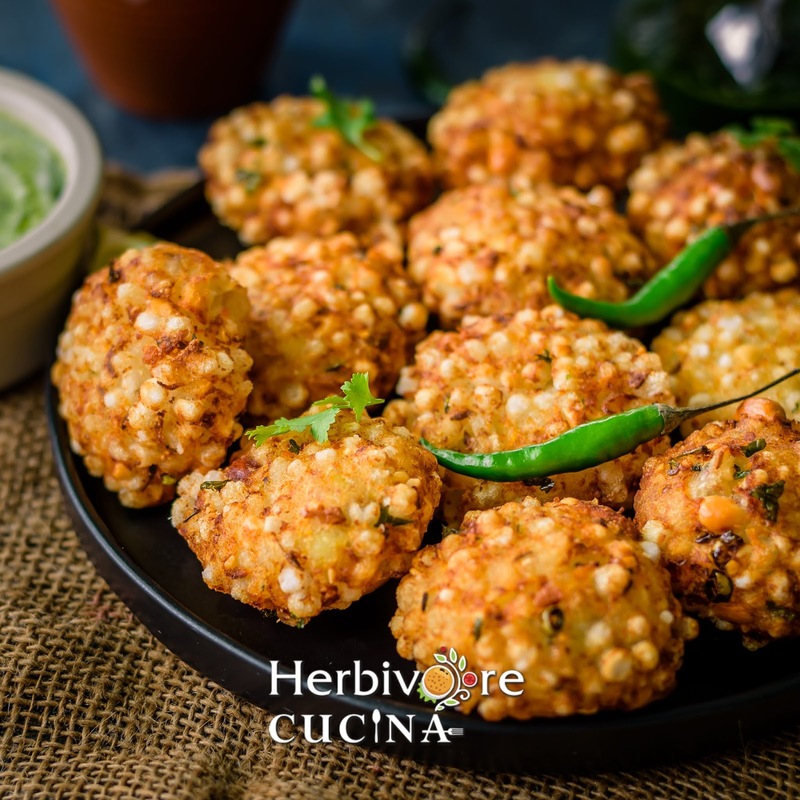 But a few days ago I was tempted to make this authentic version just before Chaitra Navratri; a festival that lots of people celebrate by fasting and enjoying such dishes. Fasting in some parts of India is actually a great idea to enjoy some recipes that are not made at other times. Sabudana, samai, kuttu, rajgira, all kinds of potatoes and yams find an application during fasting days. Out of all of these, sabudana fritters are my favorite. 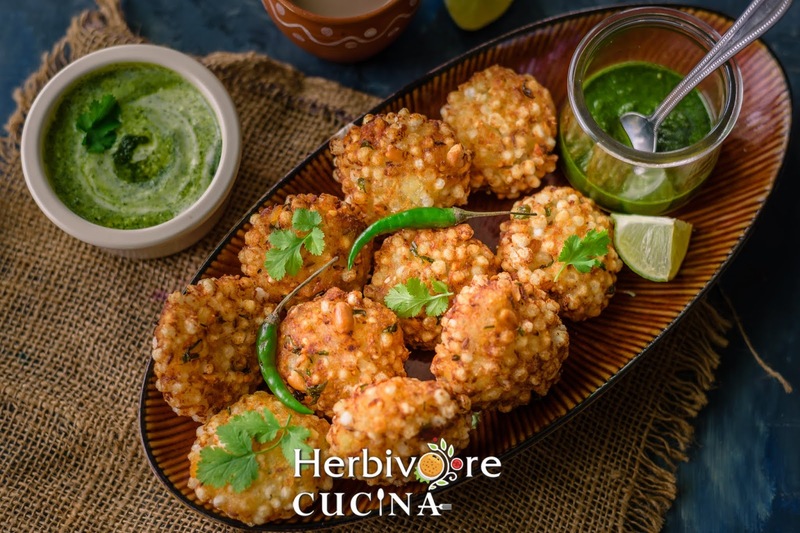 Fritters are always yum when dipped in spicy cilantro chutney, ketchup or just by themselves with chai. These fritters are like that too. I can polish off a BIG bowl filled with them in one go! 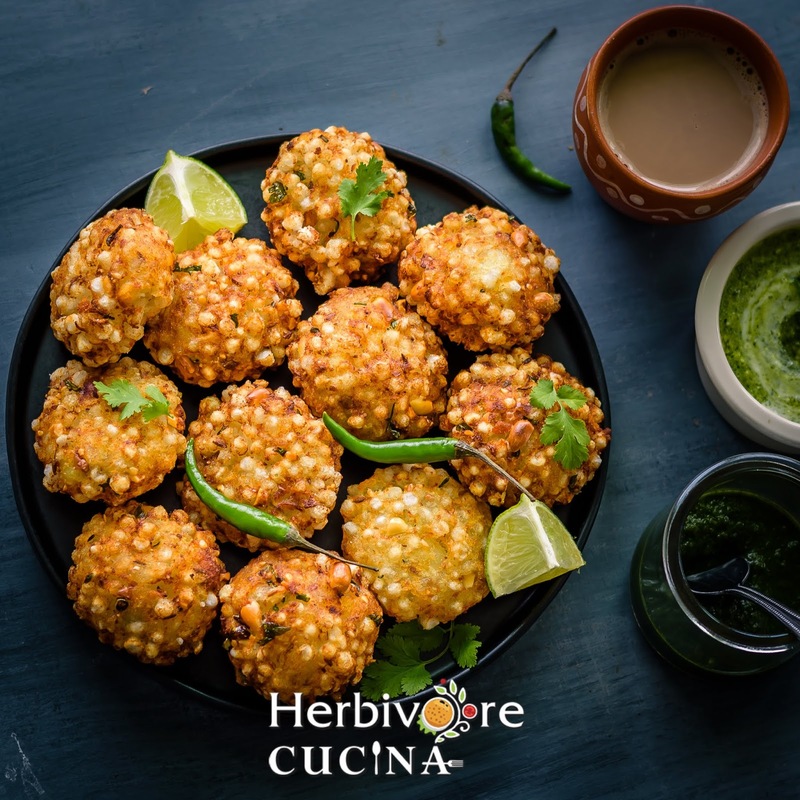 How to make perfect Sabudana Vada? Perfect sabudana vada are those which are crisp on the outside while being soft yet cooked inside. The ingredients do play a major part in them being well made, but the method makes a lot of difference too. A popular complaint many people have while making these is that the vadas separate when fried. Or that they fry in a way that the hot oil splutters all over. The easiest way to avoid this is to make sure ALL the ingredients are dry before rolling them. If there is water, that splutters out and makes quite a mess. These are BEST enjoyed hot. Even though the vada is crisp when fried, they tend to become soggy over time. So avoid making them in advance. 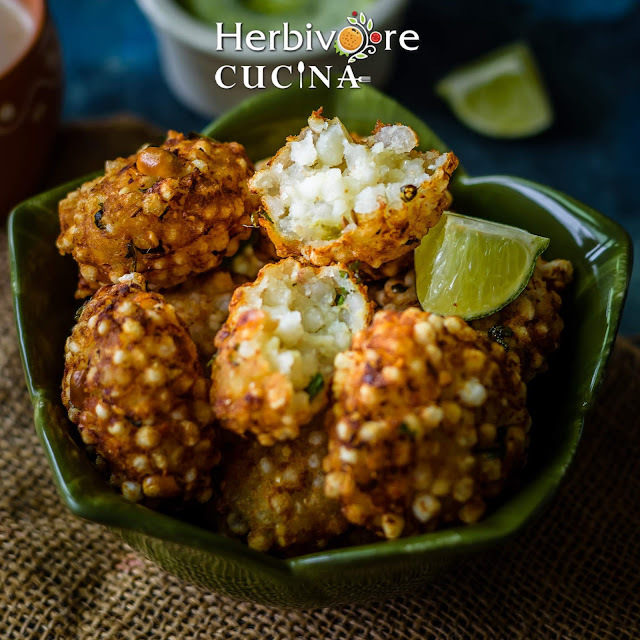 Fry them only when you are ready to enjoy them with chutney, yogurt or chai. In case there are leftovers, re-heat them in the oven. That is the easiest way to make them crisp again. Heating them in the microwave makes them soggy and weird in texture. The ingredients listed below are the ones typically used in fasting recipes. If there are ingredients that you do not like or enjoy, skip them. If the recipe is not for fasting, you can add red chili powder, diced vegetables or anything else as you like. I used the regular size sabudana but you can use the mini ones too. The mini ones do not need to be soaked; they can be rinsed and washed immediately. The chili and black pepper powder are used for heat. These are not spicy but definitely have a hint of spice. If you like the vada bland, reduce both of them to get the heat right. Rinse the sabudana well and soak in 3/4 cup water for atleast 6 hours or overnight. After soaking, the pearls should be soft. Dry roast the peanuts on medium flame. Once they are aromatic, remove from flame and cool. Process to a coarse powder and set aside. In a pan shred or mash the boiled potato. Add the peanuts and sabudana. Mix well. Then add all the remaining ingredients except oil. Using a potato masher, mash the mixture well. Apply some oil on your palms and divide the mixture into 2 tbsp parts. Roll each part into a ball and flatten them. Repeat for all of the mixture and keep the vada ready. Heat oil in a pan and once hot, add the vadas. Make sure you do not crowd the pan too much. Fry on medium flame till the outer covering is crisp. Do not fry on high flame else the vada will burn. Transfer on to paper towels. 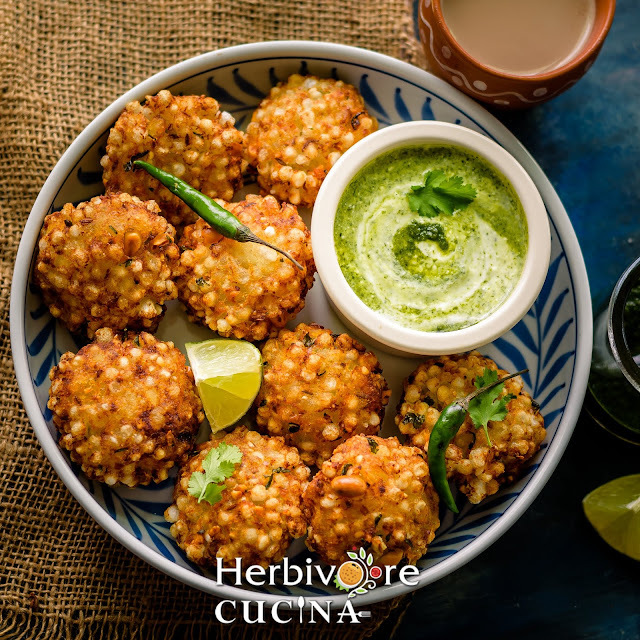 Serve with cilantro chutney or tomato ketchup. These vadas taste great with chai.